SSC CHSL 2017 Last date extended - SSC has released notification to extend the last date to apply for chsl LDC, DEO examination, hurry up and apply soon . 1. 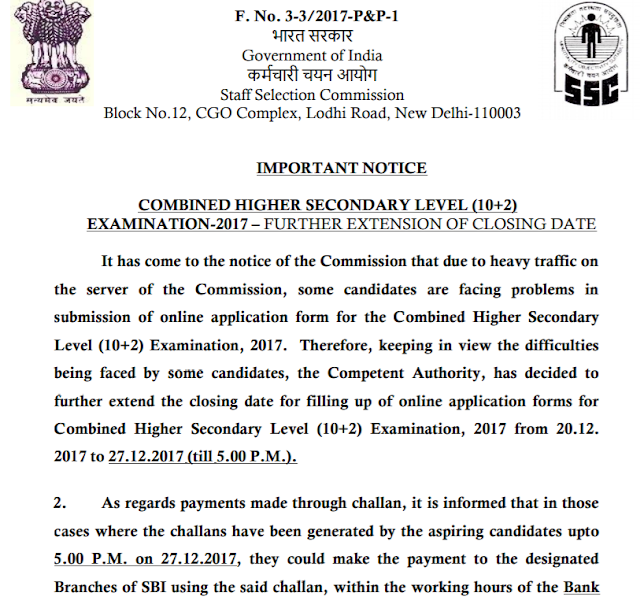 It has come to the notice of the Commission that due to heavy traffic on the server of the Commission, some candidates are facing problems in submission of online application form for the Combined Higher Secondary Level (10+2) Examination, 2017. Therefore, keeping in view the difficulties being faced by some candidates, the Competent Authority, has decided to further extend the closing date for filling up of online application forms for Combined Higher Secondary Level (10+2) Examination, 2017 from 20.12. 2017 to 27.12.2017 (till 5.00 P.M.). 2. As regards payments made through challan, it is informed that in those cases where the challans have been generated by the aspiring candidates upto 5.00 P.M. on 27.12.2017, they could make the payment to the designated Branches of SBI using the said challan, within the working hours of the Bank upto 29.12.2017. 3. The candidates may please note that no further extension of time will be given under any circumstances beyond 27.12.2017 (5.00 P.M.) for submission of online application form to the said Examination. 20.12. 2017 to 27.12.2017 (till 5.00 P.M.). All The best, sharing is caring.